Many of us first encounter birds around home. It may be the experience of seeing finches crowd around bird feeder in winter, hearing a cardinal singing every morning at dawn, or watching baby robins grow and fledge from a backyard nest that sparks for a lifelong interest in birds. Some may go on to feed birds themselves, others may start to seek out birds in parks and wildlife refuges. Publishers of nature books try to address both types of birding with guide books for field identification and for bird feeding. There are a variety of such books already. Over the past year, three more books on attracting and identifying backyard birds became available. The National Geographic Backyard Guide to the Birds of North America by Jonathan Alderfer and Paul Hess attempts to be both a bird guide and a bird feeding guide. The first 40 pages or so provide advice on feeding and attracting birds to a backyard. This includes information on bird feeders, types of seed and other foods, and bird houses. It emphasizes the importance of habitat, particularly the provision of regionally appropriate native plants to provide natural sources of food and shelter in addition to artificial ones. It suggests specific plants for each of four quarters of the lower 48 states; in the Northeast quarter, it suggests shrubs like red chokecherry and wildflowers like beebalm. Most of the book is a bird guide with identification and distribution information for 150 North American species. The species selection emphasizes common species that are likely to turn up in a backyard setting. There are, of course, a lot of species left out; I can think of a few species on my yard list that are not in the guide. Species accounts are illustrated with the paintings familiar from other National Geographic field guides. The selection seems regionally balanced, though there are some cases like screech owls where the eastern species is shown but its western counterpart is only mentioned and not illustrated. The National Geographic Backyard Guide to the Birds of North America will be most useful for someone who may not be a birder but maintains a bird feeder and wants to know what types of birds are visiting it. This is not a useful book for field birding, and if you already have a comprehensive field guide for North American birds, you will not need this one. In the past year, Bill Thompson III authored two books on backyard birds, Identifying and Feeding Birds and Hummingbirds and Butterflies, the latter co-authored with Connie Toups. Both books are branded under the Peterson Field Guide Series and the Bird Watcher's Digest labels. Both provide detailed information on attracting, feeding, and identifying birds in a backyard setting. Identifying and Feeding Birds covers birds across all species groups. Written in Thompson's informal style, its chapters on bird feeding and backyard habitat improvement are more expansive than those in the National Geographic guide. Thompson offers advice on things to do (and not to do) while providing food and shelter for birds. He emphasizes that bird feeding is done primarily for people – except in unusually harsh conditions, birds can find everything they need in nature. From that perspective, feeding should attract birds to places where people can view them while keeping the feeders as safe and beneficial for the birds as possible. Thompson provides advice on types of food to offer, types of feeders to use, proper placement of feeding stations and water features, and safe nesting sites. A separate chapter is devoted to special cases, like hummingbirds, bluebirds, and winter finches. The second half of the book provides identification and distribution information for 125 species of birds. Like the National Geographic guide, Thompson's guide selects common species that are likely to appear in backyards across North America. Unlike the National Geographic guide, which uses the painted illustrations from its flagship field guides for its identification section, Thompson's book is illustrated with photographs of the backyard bird species. There seems to be a bit of a bias for eastern birds; particularly in many species that have distinct eastern and western forms (like Fox Sparrow), the eastern form is illustrated while the western form is not. Hummingbirds and Butterflies by Thompson and Toups covers similar ground as Identifying and Feeding Birds, except with a narrower focus on the special needs of these two wildlife groups. Hummingbirds and butterflies make a natural pair, as they have similar feeding needs as adults, even though they belong to very different branches of the animal kingdom. They have other apparent similarities, in that hummingbirds are often noted as having an insect-like flight, and both hummingbirds and butterflies may be colorful and boldly patterned. The book provides substantial information on the biology and behavior of hummingbirds and addresses some misconceptions that have come to us through folklore. Hummingbirds consume two types of food: insects and other tiny invertebrates (like spiders) for protein and nectar for energy. People can help with the second by planting appropriate flowers and maintaining clean hummingbird feeders filled with sugar water. Thompson and Toups describe how to maintain hummingbird feeders and recommend regionally appropriate plantings that are attractive to hummingbirds. The hummingbird half of the book concludes with species profiles of 15 hummingbirds that breed north of the U.S.-Mexico border. Butterflies are treated in a separate section from hummingbirds. 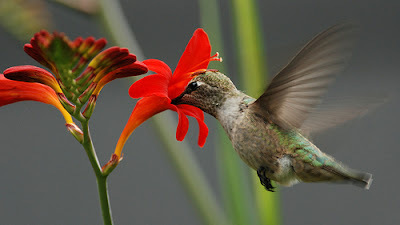 In some ways, it would make more sense to integrate the sections on hummingbirds and butterflies since they both rely on a lot of similar plants as nectar sources. However, butterflies have differing life histories from hummingbirds, so I can see why Thompson and Toups chose this arrangement. Butterflies have different food needs at different stages of their lives. When they first hatch as caterpillars, they need access to their larval host plant. Some species rely on a wide variety of host plants, but many require one or two specific plants. Once a butterfly has passed through its larval and pupal stages and emerges as an adult, it drinks nectar to provide itself with energy as it searches for a mate to reproduce. Thompson and Toups have advice for how to meet butterflies' needs at each of those life stages, including long lists of specific recommendations for regionally appropriate host and nectar plants. The butterfly half of the book ends with species profiles for 40 butterflies that are common across North America. If you already have books on bird feeding and backyard wildlife habitats, these books will probably not add much to your existing knowledge. If you are primarily want a resource for backyard bird identification, the National Geographic Backyard Guide to the Birds of North America is probably the better choice among these three books since it covers a broader selection of species. (A comprehensive field guide would be more appropriate if your birdwatching will go beyond a backyard.) Identifying and Feeding Birds and Hummingbirds and Butterflies are better choices than the National Geographic book for detailed information on bird feeding and backyard wildlife habitats. Identifying and Feeding Birds probably makes the best complement to a standard field guide among the three books since it addresses the food and habitat needs of a broad variety of birds. Hummingbirds and Butterflies covers a distinctive niche very well. This review is based on review copies provided by the publishers. Moths are not the only insects that occur with diversity in my suburban backyard. I found all of these beetles in the backyard last Tuesday, on the same day I ran the black light. When I was changing the water in the bird baths, I disturbed the beetle above from its hiding place. It bolted up a nearby tree but paused just long enough for a few photos. It is a type of ground beetle in the genus Harpalus, probably the Pennsylvania Dingy Ground Beetle, though it is difficult to identify ground beetles to species without dissection. This beetle came to my black light, and it superficially resembles the local may beetles (a.k.a. "junebugs"). Instead of a may beetle, it is a Northern Masked Chafer, which belongs to a different subfamily from the typical may beetles, though both groups come to lights. When you see this beetle side-by-side with may beetles, you can see that this one is slightly larger and much glossier. The third and last beetle is an Oriental Beetle. As you can guess from the name, this is a nonnative species; it was introduced to Connecticut in the 1920s and has since spread through the Northeast and Mid-Atlantic. Last Tuesday I ran my black light outside again. I left it on for a couple hours longer than usual, which paid off since a few moths I had not recorded before showed up near the end. I photographed about 40 species overall, with all but a few identified. (My post is coming a week after the mothing session because it took until this afternoon to find an ID for some of them.) Here are a few of the more interesting moths that visited the light. Most of the moths shown in this post were lifers. This Glossy Black Idia (Idia lubricalis) was not a new species for me, but it was a new one for the yard. The Bent-lined Carpet (Costaconvexa centrostrigaria) stood out to me as having a much stronger pattern than most of the geometer moths I see in the yard. This American Dun-bar Moth (Cosmia calami) did not stay on the sheet very long. I had to capture this Dusky Groundling (Condica vecors) and photograph it the next morning because my camera battery ran out just before it landed on the sheet. This Common Angle (Macaria aemulataria) had the unusual habit of perching with its wings folded up over its back. That made it rather difficult to get a good photo of the uppersides of the wings. Most of the Dichomeris micromoths that I have seen are pale tan or gray with variable spotting. This black and orange Black-edged Dichomeris (Dichomeris picrocarpa) has a much bolder pattern than the others. This is the first plume moth I have recorded in the backyard; I think it may be a Grape Plume Moth (Geina periscelidactylus). I am not sure what the insect next to it is. I was initially confused by this moth, but Flickr user Dougeee suggested that it might be a Bristly Cutworm (Lacinipolia renigera). It seems to have part of its pupal case attached to the end of its abdomen. This moth is one that I still have not identified. It has the shape and size of an Idia, but its pattern does not match any of the Idia species shown at the Moth Photographers Group website. It could be a very worn Idia, or it could be another species that I missed while paging through the Noctuoidea plates. This year the United Kingdom did not have a National Moth Night for the first time the event started in 1999. This was not because of lack of participation. Instead, participation had grown to the point that National Moth Night's organizers lacked the resources to manage such a large event. They plan to restart it next year after they have a chance to reorganize the event along more sustainable lines. Mothing has become hugely popular in the U.K., with even Buckingham Palace and the House of Commons running light traps for National Moth Night. The popularity of mothing has grown alongside resources to support it. Today, expert amateurs watch for new arrivals at the UK's ring of seashore moth traps, a chain of powerful, disorienting lights that resembles Churchill's wartime radar ring. The language used to record them is pure Home Office, with moths classified as wandering vagrants, transitory residents, suspected migrants and even colonists. Their website features a live Flight Arrivals icon – yellow and black with flashing arrows like those on airport websites, except that instead of the Ryanair service to Venice or Faro you have the dark sword-grass landing on the Lizard peninsula or the bird-cherry ermine checking in at Spurn. At the end of last year, a 454-page atlas was published by Butterfly Conservation and the National Moth Recording Scheme, with details of 11.3m moth records dating to 1769. The very first recorded in the UK was also one of the most dramatic: the extremely rare death's-head hawk-moth, with a skull shape on its back and a unique ability to squeak. Uh-oh. A shudder-making moth indeed – it even plays a part in the film of The Silence of the Lambs. But when pupils at Husthwaite primary raised captive death's-head hawk-moths in 2006 at Shandy Hall, the North Yorkshire home of Laurence Sterne, as a Tristram Shandy project, they loved them. It's a project they are keen to repeat. The Provisional Atlas of the UK's Larger Moths is one of two bibles which are revolutionising moth recording. The other is the Field Guide to the Moths of Great Britain and Ireland by Paul Waring and Martin Townsend, whose meticulous paintings by Richard Lewington have at last brought species identification within amateurs' reach. (Moth antennae vary from feathery to wandlike, antlerish to TV aerialesque – contrasting with the simple club shape common to all UK butterflies.) Add the unprecedented availability of light traps, now costing from £78, and the power of digital photography, and a once-elusive prey is no longer hard to find and record. British birders have a reputation for being a bit... intense, so in a way it is not surprising that mothing would catch on there once someone got the ball rolling and developed some resources to make catching and identifying them easier. Could this happen in North America? The growing participation in the Great Backyard Bird Count and the enthusiasm of attendees at East Brunswick's moth nights make me think that there may be a base of support for something like a National Moth Night, or even some longer-term projects. Yesterday I spent the morning at Fairview Farm Wildlife Preserve, a small nature refuge in Bedminster managed by the Upper Raritan Watershed Association. The preserve maintains habitats in varying stages of natural succession, from meadows to woodland. The large meadows and edge habitats make it particularly good for butterfly watching, and on a good day, a lot of dragonflies and damselflies can be found there, too. Here are a few of the Lepidoptera species that I saw yesterday. There were a lot of these little skippers flying around yesterday. This is a tiny butterfly, the Least Skipper. It is one of the few skippers that looks almost entirely orange when its wings are completely closed. In the "jet plane" posture (like above), more brown becomes visible. Most skippers are a combination of orange and dark brown, with precise patterns that differentiate the species from each other. Zabulon Skippers are typical in that regard, and (at least in New Jersey), they are good butterflies to learn to recognize as a starting point for learning skippers. The Little Glassywing is one of a handful of all-dark skippers. Its name refers to the white patches on the inner (or upper) surface of the forewing. The white patches contrast strongly with the rest of the wing, almost as if the wing has a window. This mostly drab brown butterfly is a Little Wood Satyr. It is one of several regularly occurring species in New Jersey that combine a brown ground color with eyespots around the edges of the wings. I always have trouble remembering which brown butterfly carries which eyespot pattern. This is one situation where carrying a digital camera really helps. When I see a large brown butterfly I try to get a clear photo and then work out the precise ID later. Yesterday I saw Little Wood Satyr, Common Wood Nymph, and Northern Pearly-Eye all in the same area of the preserve. The last butterfly species I recorded at the preserve was this Delaware Skipper. This was a butterfly lifer for me, and it is one I have been wanting to see for a while. The open black triangle in the center of the forewing is distinctive. The first Short-tailed Albatross born outside of Japan fledged this week on Eastern Island in Midway Atoll NWR. The hatchling broke through its shell in January on Eastern Island, one of three small, flat, coral islands that comprise Midway Atoll National Wildlife Refuge over 1,300 miles northwest of Honolulu. The parents of the Midway chick first paired up on the refuge four years ago. During that 2007-8 breeding season, they were observed spending only a little time together, but the following season, their time together increased. By the third season, they arrived at the Eastern Island breeding colony together and built a nest, but did not lay eggs. This breeding season, one of the pair was observed incubating a freshly laid egg on November 16, 2010. The pair has been under close observation ever since. The U.S. Fish and Wildlife Service (FWS) reports that the birds’ leg bands reveal that the male of the pair was hatched on the island of Torishima, Japan in 1987, while the female hatched there in 2003. After the egg hatched in January, the parents spent the next five months bringing squid and flying fish to their chick every one to three days. In doing so, they logged tens of thousands of miles, likely soaring between Midway and the nutrient-rich feeding grounds some 1,000 miles to the northwest. While the parents were both away on one foraging trip, the chick was swept off its nest by the tsunami resulting from the catastrophic Japanese earthquake of 11 March. It survived the ordeal, and in May, after months of steady feeding and growth, had lost most of its downy look and begun stretching and exercising its wings. 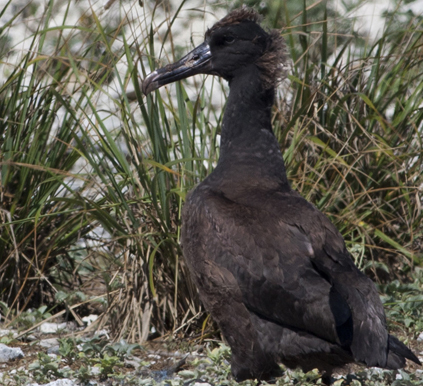 Anticipating its fledging, the chick was banded by FWS biologists on June 8. It has now left the island and is most likely headed in a northwesterly direction to the rich and productive waters near Hokkaido, Japan. On average, Short-tailed Albatrosses begin breeding at 6 years of age, but often begin prospecting at nesting sites several years earlier. So, it is our hope that this bird return in 4-6 years, and it could begin breeding by about 2017, provided it finds a mate. Hopefully it will be the first of many Short-tailed Albatrosses to fledge on Eastern Island. The refuge is already home to the world's largest population of Laysan Albatrosses. This makes it a natural site to establish an alternate breeding location for an endangered albatross. The endangered Short-tailed Albatross was once the most abundant of the North Pacific albatross species, numbering more than a million birds. It was decimated by feather hunting at the turn of the 20th Century, and by the late 1940s was thought to be extinct. In the early 1950s, ten pairs were discovered breeding on Torishima. The population has now reached 3,000 individuals, with some birds on the Senkaku Islands, but most still on Torishima. Conservationists fear an eruption of the active volcano on Torishima could spell disaster. Starting in 2008, an international team led by Japan’s Yamashina Institute began translocating Short-tailed Albatross chicks to Mukojima Island to create a new “insurance” population. In 2011, 15 chicks were moved to Mukojima, bringing the total number translocated to 55. So far, seven of these birds have returned to Mukojima as non-breeding juveniles, an encouraging sign that they will return to breed when they reach maturity. Outside the breeding season, the Short-tailed Albatross ranges along the coasts of eastern Russia, Korea, China, Taiwan, and Alaska and the Hawaiian Islands, and occasionally off the Pacific Coast of North America. It will be interesting to see if this is the start of a larger colony. Ovenbirds and Veeries eavesdrop on chipmunk calls to decide where to nest; since chipmunks eat eggs and nestlings, the birds try to nest as far away from hotspots of chipmunk activity as possible. The U.S. Fish and Wildlife Service is conducting a formal review of the Eskimo Curlew's status to decide whether the bird should remain listed as endangered or be classified as extinct. The last confirmed sighting of the species was in Nebraska in 1987. Here is the announcement (pdf) in the Federal Register. That link has information on how to contact the Fish and Wildlife Service if you have seen living Eskimo Curlews (unlikely) or wish to comment on the review. Experiments that include the ultraviolet part of the spectrum concluded that birds produce only few of the color combinations that are possible for them to see. Maryland's only nesting female Goshawk was shot and killed; as a result, her offspring perished from lack of feeding or protection. Who shot the bird is unknown. In many cases, birds flap-run to scale obstacles in order to save energy; that style of movement takes less power than flying the same distance. Male Wire-tailed Manakins cooperate at leks to win attention from female birds. Cooperative behavior is unusual in lek mating systems. Many birds thought extinct due to deforestation have since returned to Amazon rainforest. Feral pigeons can differentiate between friendly and hostile people when they forage in urban environments. A new analysis of bird evolution posits that birds evolved through the loss of a gene that aids thermoregulation through fat reserves and the consequent development of muscles that generate heat instead. Birding is Fun! : What does eBird tell us about "Birder" behavior? Birders in New York and nearby states should be aware of a new tick-borne disease, babesiosis. This blood parasite is carried by deer ticks and produces flu-like symptoms and occasionally more severe results. New research finds that caribou in Alberta are threatened by oil sands mining activity rather than predation by wolves since the latter mainly prey on deer. Mining activity is at its peak at times when food for caribou is most scarce; their foraging activities are interrupted whenever they get spooked by heavy equipment. Surveys in Sweden have found declines in their native pollinators, to the point that previously common bumblebee species are so rare as to warrant red listing. As a result, red clover plants – an important forage crop that depends on pollination services – have produced fewer seeds in recent years. In North America, factors like the presence of dead wood and soil characteristics are better predictors of what native bee species will be present at a location than a site's plant species composition. The key seems to be the suitability of a particular site for nesting. New research in the Pacific shows the importance of food hotspots for apex predators, especially blue whales, which travel from hotspot to hotspot as they migrate. Scientists consider the Pacific's California Current as an oceanic hotspot akin to Africa's Serengeti Plain. Seven new species of field mice were discovered on the island of Luzon in the Philippines. A new study found that sea level along the East Coast of the U.S. is rising faster than at any other time in the last 2,000 years. The current rate is consistent with a local sea level rise of three feet by 2100. The Obama administration will institute a 20-year ban on new uranium mining claims around the Grand Canyon in order to protect the Colorado River watershed, which is a crucial source of drinking water for the region. New York area birders are excited about the presence of a Hooded Crow in a park in Staten Island, New York. This would be an extraordinary record if the crow got here on its own, without the assistance of a bird collector or ship. Meanwhile, on the other side of the world, New Zealand has just as unusual of a visitor. A young Emperor Penguin arrived on New Zealand's Kapiti coast. Experts had checked the bird, nicknamed Happy Feet, and confirmed it was healthy and in good condition, biodiversity programme manager Peter Simpson said. It was venturing into the sea at night to feed and moving between locations on the beach. "We keep our interference with wild animals to an absolute minimum, and this emperor penguin is no exception." The juvenile penguin, was named by Peka Peka Beach resident Chris Wilton, who first saw it on Monday afternoon, standing on the beach flapping its flippers. It weighs about 10 kilograms and stands about a metre tall. It is only the second time an emperor penguin has been recorded on New Zealand shores and DOC put up a sign near it yesterday, urging people to keep their distance and to ensure dogs were kept on leads. Mr Simpson said people had flocked to the beach to see the penguin and a lot of admirers had asked why it was not being taken back to Antarctica. "It is midwinter and completely dark down there, there is nothing going there. "More importantly, during its long trip here, it would have come across other penguins and penguin diseases and we do not want to take it back and introduce those diseases to Antarctica." This is the first record of that species in New Zealand in 44 years. Moths are not the only insects drawn to UV lights. A broad range of insects from several orders may appear on a sheet on a good night. Here are a few from East Brunswick's moth night last Friday. The highlight by far was a Reddish-brown Stag Beetle (Lucanus capreolus) that stayed near the mercury vapor lamp for most of the evening. This beetle, also known as the pinching bug, has smaller jaws than its southern relative, Lucanus elaphus, but it still looks quite fearsome. Another large beetle present appeared to be some sort of dung beetle. June bugs (Phyllophaga sp.) are regulars at UV lights. Several caddisflies landed on the sheet. The mothing sugar drew some interest as well. On one tree wood roaches (Parcoblatta sp.) were sipping at the sugar. The same tree featured a lot of isopods. Other trees were visited by harvestmen (order Opiliones), also known as daddy-long-legs. I was not surprised by the presence of roaches and isopods at the sugar, but I did not realize harvestmen liked sugary foods as well. As BugGirl reminds us, the last week in June (this year, June 20-26) is designated as National Pollinator Week. Pollinators are the insects, bats, and birds that move pollen from plant to plant in exchange for food (in the form of nectar or pollen). Bees are the most efficient insect pollinators, but wasps, butterflies, moths, flies, and beetles also do pollination work. Pollination is important because it enables plants to exchange gametes more efficiently. The gametes from the male parts of a plant need to come in contact with female parts (preferably of another plant) in order for the plant to produce fruit or seeds. Without the services provided by pollinators, we would not have delicious foods like coffee, chocolate, blueberries, strawberries, and apples. In the long run, cross-pollination is important for maintaining genetic diversity among a plant population. Here is list of events for Pollinator Week, such as butterfly walks and lectures on pollinators and native plants. Another activity to consider is making a pollinator garden, full of plants or foraging and larval host plants, or modifying an existing garden to be more pollinator-friendly. By entering your zip code, you can get a pdf booklet with recommendations of plants suitable for your region. Here are the recommendations for my region, the Eastern Broadleaf Forest (Oceanic) Province. The Xerces Society also has pollinator conservation resources and guidelines. The Xerces Society has also published a book on pollinators, which I reviewed here recently. Here are a couple of insect pollinators I found in the backyard recently. Above is a small carpenter bee (Ceratina sp.) feeding on butterfly weed. Below is a Summer Azure (Celastrina neglecta) resting on a leaf. Mothing at home can be fun and productive. It has the added benefit of being convenient to set up and take down, and proximity to the house makes it possible to take breaks if the action is slow. Still, it is interesting to see what a UV light will produce in a different habitat, especially a more natural one. So, last Friday, I went with Anita to participate in East Brunswick's annual moth night. I had been to one two years ago with Patrick, and that helped get me started with nocturnal mothing. This year's event was at Keystone Park instead of the Butterfly Park. The main differences in mothing at the two sites are that Keystone Park is closer to the South River, so it offers a greater chance for species characteristic of wetland environments, but it lacks butterfly gardens, so there would not be much a chance to watch moths nectaring at flowers. The event uses a bright mercury vapor lamp set in front of a white sheet. Mercury vapor lamps shine into the UV part of the spectrum, which attracts more moths than a normal incandescent or CFL bulb would. Trees along a short trail through the woods were painted with a sugary paste made from brown sugar, stale beer, and other ingredients. The two methods are intended to attract different types of moths; some are attracted to light but not to sugar (in some cases because they lack mouthparts) or to sugar but not light. The light attracted quite a lot of moths, some of which I never really got to see because the area in front of the sheet was crowded at times. One of the first moths I saw was the Dimorphic Macalla Moth (Macalla superatalis) shown above. From a distance, it does not look like much, but up close you can see the vivid green and rusty stripes on its forewings. One of the larger moths at the sheet was this tussock moth. It may be one of two species, Banded Tussock Moth (Halysidota tessellaris) or Sycamore Tussock Moth (Halysidota harrisii). Based on subtle differences in their costal patterns (the costa is the leading edge of the forewing), I think this is a Banded Tussock Moth, but I could be persuaded otherwise. Several geometer moths visited the mercury vapor lamp, including a few that are familiar to me from mothing at home. One of the more interesting geometers was this gray moth. Its markings are so indistinct that it still leaves me a little uncertain. I think it may be a Canadian Melanolophia (Melanolophia canadaria). 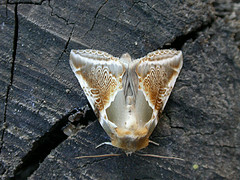 Among other things, moths of that species feature a noticeable flying gull shape at the trailing edge of the forewing; that marking is clearly visible in this photo. The moth is joined by two other insects, the topmost of which is a Ptilodactyla beetle. One other notable moth on the sheet was this crambid moth, called a Checkered Apogeshna (Apogeshna stenialis). Micromoths can seem at times like an army of drab, tiny creatures that are barely distinguishable from each other, but some micromoths are quite intricately patterned like this one. This was my first sighting of a plume moth. I think this one may be Himmelman's Plume Moth (Geina tenuidactylus). The sugared trees were mainly attended by isopods and wood roaches, with relatively few moths taking advantage of the opportunity for a snack. One walk back along the trail, however, yielded the moth of the night. Anita was the one who found it, a large Ilia Underwing (Catocala ilia) sipping at the moth sugar. The moth kept its forewings spread open, so that it was possible to see and appreciate the orange and black hindwings that give this and other Catocala moths their name. While I have seen other moths named "underwing" before, I think this is my first sighting of a true underwing in the genus Catocala. When it tired of our flashlights and cameras, the underwing flushed and tried to hide under a nearby leaf. This was not an effective hiding place for a large moth with bright orange wings. Before the evening ended, this sphinx moth landed on the back side of the mothing sheet. While its eyespots are somewhat hidden in this view, there is enough detail visible to mark it as a Small-eyed Sphinx (Paonias myops). The eyespots and bright hindwings, normally hidden from view, can be displayed to baffle or confuse predators just enough for a moth to escape (mostly) intact. Not all sphinx moths have such clear eyespots as this one does. Yesterday morning I went over to Negri-Nepote Grasslands Preserve to look for a Dickcissel that had been reported there the weekend before, and then reported sporadically through the week. On the way out, I heard and then saw Grasshopper Sparrows pretty quickly. My route went through at least three distinct breeding territories. Chipping Sparrows, Field Sparrows, and a House Wren were also singing along the way. I had some nice looks at Field Sparrows close to the path. The pond had the usual summer grouping of swallows, an Eastern Kingbird, and a Killdeer. I think I also saw a Cedar Waxwing flying over the pond as well. The Dickcissel had been reported in the area between the pond and the house in the middle of the preserve, so I waited along the main path there to see if it would appear. While I waited, I got to listen to Grasshopper Sparrows, Field Sparrows, and Indigo Buntings singing around me. A pair of Orchard Orioles flew pastin tandem. Tree Swallows darted back and forth, while one Tree Swallow seemed content to sit on top of a nestbox. After a while I decided to try my luck from a different position, so I followed the trail between the house and the pond. I searched around a bit more without spotting it, so I asked another birder named Doug if he had seen it. Sure enough, he had, and he pointed it out to me – both the perch where it was sitting and its song. Once he did point it out, the song suddenly sounded a lot more noticeable to me – I must have missed it among the ambient bird sounds that I had been hearing to that point. Doug was nice enough to let me look at it through his scope for a closer view. A spotting scope definitely helps for this bird since the viewing distance can be quite long for such a small bird. The viewing distance was too far for me to attempt photographing the Dickcissel. (Here is a photo of one of the Negri-Nepote birds from another birder.) However, I did photograph some butterflies while I was there. Above is a Cabbage White, one of the most common butterflies in the area. This individual is a bit more yellow than most. The one below is an Eastern Tailed-blue, puddling on some mud. I published my first post on A DC Birding Blog six years ago today, June 18, 2005. Since then, I have kept it going on a regular basis, and on a daily basis for the last few years. I originally conceived the blog as a journal for my birding walks in Washington, DC. That is more or less what it was for the first two years. Then, in summer 2007, I moved to New Jersey. The locations of the birding walks changed, and I also began adding more content about insects as my interests shifted to butterflies, dragonflies, and finally moths. News about birds and the environment has been a mainstay of the blog almost since its beginning. The weekly "Loose Feathers" series, which gathers bird and environmental news from the preceding week, debuted in November 2005. Since I started blogging, the blogosphere has changed quite a bit and its imminent death has been predicted several times. A lot of the blogs I enjoyed in my first year of blogging are now gone. When I started blogging, there was no Twitter, and Facebook was still restricted to college students. Bloggers found other interesting blogs through toplists and blog carnivals; both of those methods have since waned in favor of social media. Even I and the Bird, one of the longest-running and most popular blog carnivals, has ceased operations. 10,000 Birds is still chugging along, thanks in part to its transformation into a group blog. The House and Other Arctic Musings may have changed houses, but Clare still offers plenty of musings on the Arctic. Bootstrap analysis was recently revived after a period of dormancy. Mike's Birding and Digiscoping Blog is still running. The Birdchaser is still chasing birds and blogging about them. Snail's Tales is still researching and writing about snails. Woodcreeper still posts radar maps during migration. The Urban Dragon Hunters are still hunting urban dragonflies. Bird Treatment and Learning Center is still active. The City Birder is still birding around Brooklyn. GrrlScientist is still blogging, but no longer at her original blog. I hope I did not miss anyone. There are of course many science blogs that have sustained operations since 2005 or earlier, but I am only including ones that I have been reading continuously since the early days of the blog. There are also many blogs that I read avidly that have since ceased publication or publish less frequently than they used to. Of course, the constant turnover in the blogosphere has also produced a lot of great bird blogs in the intervening years, and some of the ones I read most regularly now were started well after I started this blog. I look forward to another year of blogging, and I hope this year is better than the last! 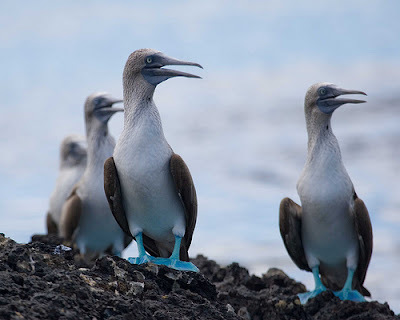 The Galápagos Conservation Trust declared today Blue-footed Booby Day. The birds are named for their bright blue feet, which play a key role in their courtship dances. Learn more about these birds here or at the Blue-footed Booby Day website. EBird released its new data entry form out of beta. The new data entry method allows users to submit checklists with fewer steps and encourages users to add details, such as descriptions for a rare bird or breeding codes. I have been using the new data entry system for a few weeks now, and once I got used to the single-column format, I found it much easy than the old method. New York City's Department of Environmental Protection has made arrangements to ship geese killed during this culls to food banks in Pennsylvania. The city is culling Canada Geese around the its airports to reduce the risk of collisions between birds and airplanes. Scientists are studying migratory songbirds in the Arctic to learn how climate change is affecting their use of traditional food sources and their breeding patterns. A new study argues for saving old trees to protect the nest holes for the birds and mammals that use them. Research suggests that Tree Swallows with the highest level of stress hormones have the most breeding success. Bald Eagles and unusual weather patterns decimated the Double-crested Cormorant and Caspian Tern colonies at the mouth of the Columbia River this spring. 10,000 Birds: Are Birds Really Dinosaurs? According to a recent survey, two-thirds of New York City's rooftops are suitable for solar panels; together they have enough area to meet about half of the city's electricity needs during periods of peak demands. The survey is based on data gathered by a plane equipped with Lidar that made passes over the city last year to measure the size, shape, and amount of sunlight on its rooftops. The data is available at a CUNY website. This year the dead zone in the Gulf of Mexico is forecast to be the largest ever due to flooding in the Midwest. In addition to causing destruction upstream, the floodwaters are carrying more nutrients than usual. The U.S. Senate voted to end subsidies for corn ethanol but the measure has yet to pass the House. The White House has decide to mock a cheap website on the endangered Desert Tortoise as a symbol of government waste. More here. Here is an example of people using the invasive weed mugwort as a remedy. The Dragonfly Woman: What is a June Bug? I found this Celery Looper in the back garden yesterday. I would have missed it if it stayed still, but it flushed from one hiding place and landed in the grass, where its location was more obvious. Loopers as a group have a very distinctive shape. When they fold their wings tent-like over their backs, they appear to have a hump over their thorax and another a third of the way down the back. The outer end of the wing appears fan-like. The odd shape helps them disappear into the foliage. When a looper presses itself up against a dried leaf or plant stalk, it looks like just another dried leaf. Celery Loopers feed on a variety of plants as larvae – including but not restricted to celery. Other host plants include blueberry, clover, plantain, and viburnum, as well as various cultivated vegetables. Adults are sometimes active during the day and nectar at flowers. Two nights ago I put out the black light and sheet again to attract moths. During the summer I try to do a mothing session about once per week, but sometimes the intervals are longer. This week's session was slower than last week's. The starting temperature was about 15°F cooler than the previous week, plus the moon was nearly full. Both factors may have contributed to less activity at the sheet. Still, there was a nice group of moths. I have about 10 species identified so far, with a bunch more moths left for identification. Here are a few geometer moths that showed up. In their larval stage, Geometer moths (family Geometridae) are known as inchworms. The caterpillars lack prolegs in the middle of their bodies, so they have a looping walk, as if they are measuring the earth inch by inch. The moth above is a Single-dotted Wave (Idaea dimidiata); I had this species in the yard last summer. Many moths have fanciful English names, such as this one, which is known as The Gem (Orthonama obstipata). In this case, the name seems deserved, given this female's rich red and black coloration. This species was new to me. This moth is a Common Tan Wave (Pleuroprucha insulsaria). Adult geometers usually rest with the forewings and hindwings both spread out. So I found it odd to see this moth with its wings folded over its back, in the manner of a hairstreak or blue butterfly. Unfortunately I did not get a photo of its dorsal side, so I cannot be sure of the species. If anyone wants to suggest an ID, feel free to do so.